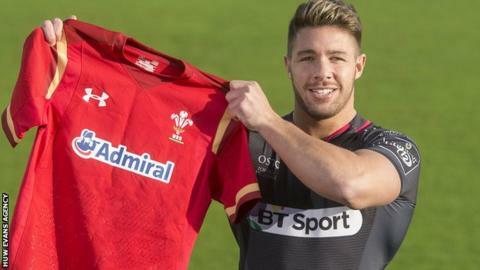 Wales scrum-half Rhys Webb is "extremely doubtful" for Ospreys' match against Edinburgh on Friday after suffering a head injury in their 21-17 win over Munster. Webb began to make his case for a Wales recall off the bench in the region's Pro12 triumph in Cork. But he departed in the final moments after a clash of heads. "It's disappointing for us but more importantly it's about Rhys," said head coach Steve Tandy. "I don't think it'll keep him out for too long, but with these head injury assessments you've got to make sure that players are at the forefront of these decisions. [He's] extremely doubtful." Webb later tweeted: "Thanks for all your messages. I'm fine but due to a short turnaround won't have enough time this week. Don't worry I'm back." He was making his first regional appearance of the season after suffering a foot injury in Wales's world cup warm-up against Italy. He missed his country's progress to the tournament's quarter-finals and Scarlets' Gareth Davies has become a try-scoring star in his absence. Davies scored a crucial try in Wales' World Cup win over England at Twickenham and got another as they beat Scotland in the Six Nations on Saturday. Webb has hopes of returning to Wales duty during the current tournament. They host France in Cardiff on Friday, 26 February before a 12 March date with England which coach Warren Gatland believes could be a tournament decider. Wales' Six Nations campaign ends in Cardiff against Italy on Saturday, 19 March. Ospreys are likely to be without prop Dmitri Arhip (back injury) but hope to have props Paul James and Aaron Jarvis, and lock/flanker James King, released from the Wales squad. The three have not featured in Wales's match-day squad for the opening two Six Nations matches. But wings Jeff Hassler and Eli Walker are likely to be back in the Ospreys squad for the Liberty Stadium encounter against Edinburgh, who lost 22-21 away to the Scarlets.